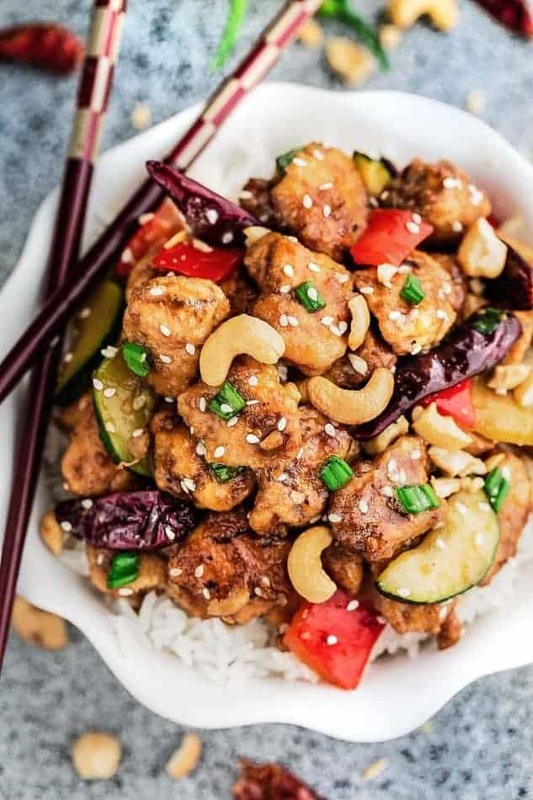 Kung Pao Chicken – This popular takeout recipe is made healthier with the same classic taste as your local Chinese restaurant. Kung Pao Chicken - an easy ONE PAN stir fry for busy weeknights. Best of all, this popular takeout favorite is lightened up with the same classic sweet & spicy flavors as your local Chinese restaurant. In a medium bowl, combine all the ingredients for the sauce. Set aside. Season chicken with salt, pepper, cornstarch and 1 tablespoon of sauce/marinade. Add oil to a wok or a large non-stick skillet over medium-high heat. Add the chicken and stir-fry for 5-6 minutes, or until the chicken is starting to brown. Toss in the zucchini, bell peppers and dried chili peppers (if using) and cook for 2-3 minutes, or until the vegetables are crisp-tender and the chicken is cooked through. Pour in the remaining sauce and add the cashews. Toss everything together and allow sauce to bubble and thicken. Season with salt, pepper or additional red pepper chili flakes as needed. Remove from heat and serve warm on a large platter or over zoodles, cauliflower rice(paleo), quinoa or regular rice or noodles. Sprinkle with sesame seeds and green onions if desired. Cook rice and divide evenly into lunch containers. Add cashew chicken, cover and store in fridge for up to 4 days.